Vital Statistics on Congress is a regular publication of the Brookings Institution. Since its first publication in 1980, it has become a go-to reference guide for those interested in congressional affairs. This blog is the fifth in a series that will highlight interesting data trends in each chapter of the most recent update, released January 2017. While much recent attention has been paid to the Trump administration’s struggles to staff high-level government positions—struggles that, as John Hudak argued last week, may only get worse—most federal employees are not political appointees, but civil servants. Within the career civil service, staffing problems are nothing new. According to the Office of Personnel Management (OPM), there were roughly 2,079,000 executive branch employees in 2014. In perspective, the executive branch employed 2,066,000 workers in 1952 when the population of the United States was just under half what it was in 2014. The size of the federal workforce has fluctuated somewhat during the postwar era, but has certainly not increased proportionally with population size of the country. Each of these agencies serves an important function in keeping Congress running. The Congressional Research Service, often referred to as “Congress’s own think tank,” provides research support for members of Congress and their staffs. Originally established in 1914 as the Legislative Reference Service to accomplish the goal of maintaining an “informed and independent” legislature, it was reorganized into the Congressional Research Service (CRS) in 1970 to provide research and analysis in direct support of the legislative process. Resulting in part from Brookings’s studies of the congressional budget process, the Congressional Budget Office (CBO) was authorized in 1974 to provide Congress with analysis on budgetary and economic issues. At the time, this helped solve the perceived information advantage that the Office of Management and Budget gave President Nixon. Since then, though, the number of staff in both of these agencies has remained relatively unchanged. The most dramatic shift has taken place within the Government Accountability Office (GAO), which, as Congress’s “watchdog”, oversees the executive branch to ensure that the laws are faithfully executed. Since its establishment just after World War I, GAO has taken on the responsibility of keeping Congress informed on how well the government is operating. Over time, complex political pressures have encouraged lawmakers to cut GAO budgets in order to reduce the size of government. As a result, GAO’s total staff has decreased from 4,905 in 1975 to 2,989 in 2015, despite the fact that their responsibilities have remained roughly the same. Growing responsibility without corresponding growth in staff means that Congress’s members and staff must stretch their resources. The problem is, what Congress has to do to stretch the capacity of their existing workforce further does little to increase real efficiency, and instead forces adaptations that, as Lee Drutman argues, hurt congressional independence. Take, for example, the CRS and the CBO. When a difficult policy issue comes up for legislative consideration, the goal of the CRS is to explain and contextualize the issue and the implications of possible legislative action in an independent, non-partisan way. The CBO, charged with assessing the budgetary implications of proposed legislation, similarly provides information on the possible implications of proposed legislation, but within a budgetary context. When the CRS and the CBO do not have adequate staff to provide Congress with the information it needs to make informed decisions, Congress members must either A) turn somewhere else for their information, or B) make less informed decisions. It is generally tough to say how “informed” any particular member is on each vote he or she takes, but there is evidence that, in the absence of other sources of information analyzing a piece of legislation, Congress members will fall back on documents provided by interest groups and lobbying efforts. The obvious problem with this coping mechanism is that information provided by third-party interest groups is sure to be biased in favor of the interest they represent and/or against an interest they oppose. Yet the alternative of making less-informed decisions is no better. Just this month, Republican members of the House of Representatives faced criticism for passing a revised version of the American Health Care Act before the CBO had a chance to “score” the measure. Without CBO input, it is nearly impossible for members to know how much a new law might actually cost the ever-rising number of constituents they represent. A third coping strategy to pass bills without fully having to understand their implications is to craft vague legislation that passes much of the decision-making authority over to whichever executive branch agency will be in charge of executing the law. In a way this makes sense—let the career professionals who handle these things every day decide the best course of action. However, that strategy presupposes that the decisions that those career civil servants make are in line with the intent Congress had in passing the legislation in the first place. While Congress theoretically has the authority to oversee the functioning of the executive branch, they may lack the personnel capacity to do so. As previously discussed, the Government Accountability Office has taken the biggest numerical staffing hit of all three support agencies. In its FY 2017 budget justification, it stated that recent budget cuts had “resulted in GAO losing about 15 percent of its staff capacity and dropping below 3,000 FTEs for the first time since 1935”, and that, “without sustained, predictable, and modest annual budgetary increases, GAO risks being unable to backfill these critical leadership positions and maintain a sufficient staff capacity to meet the highest congressional priorities.” Those priorities include studying and auditing executive agencies and reporting back to Congress on how effectively and efficiently those agencies are accomplishing their goals. Without adequate staff to raise the alarm when the executive branch is behaving improperly, it will be nearly impossible for Congress members know whether to intervene in executive affairs. As John Dilulio argues in Bring Back the Bureaucrats, cutting federal staff forces government to adapt in order to continue functioning—but not in the way many might think. Rather than becoming more efficient to take full advantage of scarce resources, government organizations develop coping strategies that make operations less efficient and effective. While Dilulio’s book focuses mainly on the executive branch, the same dynamic is present in the legislature as well. 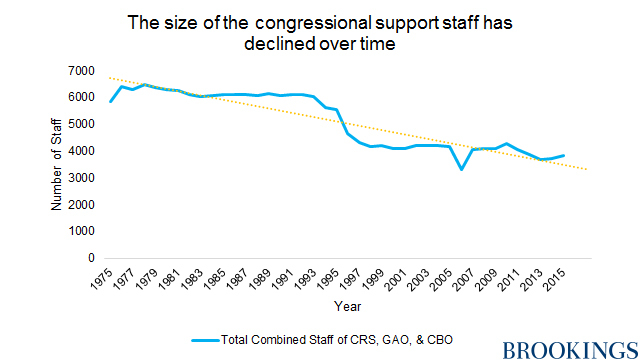 While it may be hard for Congress members to make the argument that they deserve more staff at a time when congressional job approval is less than 20 percent, the longer they go without the staff they need, the worse a job they’re bound to do.